Even a drink or two a day of alcohol may raise the risk of the most common type of breast tumors-those fueled by the hormones estrogen and progesterone, according to one of the largest studies if its kind. A second study shows that specific variations within two genes involved in metabolizing alcohol are associated with an increased risk for breast cancer in postmenopausal women. While the studies do not prove cause and effect, they lend plausibility to growing evidence implicating drinking as a risk factor for breast cancer, says Elizabeth Platz, ScD, a specialist in cancer prevention at the Johns Hopkins Bloomberg School of Public Health. "The beauty of the research is that it tells us something about the mechanisms" by which alcohol may raise breast cancer risks , she tells WebMD. Platz moderated a news conference to discuss the findings at the annual meeting of the American Association for Cancer Research. Some breast tumors are fueled by hormones, while others are not. In the first study, National Cancer Institute (NCI) researchers wanted to determine if the hormone status of a tumor influences the relationship between alcohol use and breast cancer risk. The researchers reviewed data on 184,418 postmenopausal women, who answered questions about how much alcohol and what type of alcohol they drank each day. They were followed for an average of seven years. Overall, moderate drinking raised the risk of developing breast cancer, regardless of whether a woman's preference was for beer, wine, or hard liquor. And the more she drank, the greater the risk. But most of the increased risk was seen in women whose tumors were fueled by both estrogen and progesterone, says Jasmine Q. Lew, a fourth-year medical student at the University of Chicago who led the research. These tumors, referred to by doctors as being estrogen-receptor and progesterone-receptor positive, or ER+/PR+, account for many breast cancers. Compared with teetotalers, women who drank one to two drinks a day were 32 percent more likely to develop ER+/PR+ breast cancer. 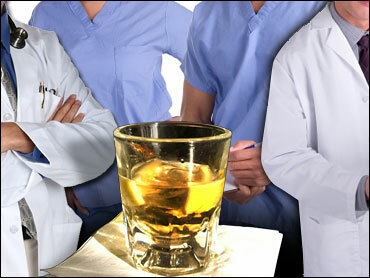 Having three or more drinks daily raised the risk of ER+/PR+ tumors by 51 percent. Lew says that drinking alcohol also appeared to raise the risk of a more aggressive type of tumor known as estrogen-receptor positive, progesterone receptor negative, or ER+/PR-. But so few women fell into this category that the finding could have been due to chance. In women with estrogen-receptor negative, progesterone-receptor negative (ER/PR-) tumors, there did not appear to be a link between drinking and breast cancer. Why would drinking raise the risk of hormone-fueled tumors? "Our hypothesis is that alcohol interferes with estrogen metabolism , which in turn increases the risk of hormone-sensitive breast cancer," Lew tells WebMD. The second study looked at whether our genes may help explain the apparent link between alcohol and breast cancer. The researchers studied DNA samples from 991 women with breast cancer and 1,698 women without cancer. They found that variants in two genes involved in metabolizing alcohol- ADH1B and ADH1C-raised a postmenopausal woman drinker's risk for breast cancer by up to twofold. "The higher their alcohol consumption, the higher their risk," says Catalin Marian, MD, PhD, a research instructor of cancer genetics and epidemiology at Georgetown University. Marian cautions that the work is preliminary and further study is needed. Alcohol: Good for the Heart, Bad for the Breast? In the meantime, how should a woman weigh the new findings against reports that a few glasses of wine may be good for the heart? Platz says that's where individual risk factors come in. If breast cancer runs in your family, you may want to think twice about drinking regardless of heart risks, she says. That's because many risk factors for breast cancer, such as genetics or family history, cannot be modified, Platz explains. With heart disease , on the other hand, there are lifestyle changes such as losing weight and exercise that can lower risk-without adding drinking to your routine, she says. The bottom line: "Step back and look at all the different risk factors and talk to your doctor about lifestyle changes," Lew says.